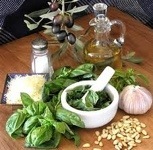 Pesto is a sauce traditionally made of basil, pine nuts, olive oil and Parmesan in Italian cuisine. The word pesto means “pounded” in the Italian language, which refers to the culinary way to prepare it with a mortar and pestle. You pound the ingredients into a fragrant, savory mixture perfect for coating long pasta noodles. Most people like use a food processor instead to make pesto, which makes a quick healthy meal that delivers rich nutritional value and unforgettable flavor. Vitamins: The garlic and basil leaves in pesto contain vitamins A and C. The vitamin A content in a serving of pesto is 560 IU, or 11 percent of the Food and Drug Administration daily value. The vitamin C content is 5 mg, or 8 percent of the 60 mg FDA daily value. Vitamin A is important for skin and eye health and vitamin C is important for supporting the immune system and generating collagen for skin repair. 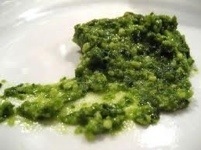 Minerals: The minerals found in notable amounts in pesto include potassium and phosphorus. The potassium content is about 60 mg, which is 2 percent of the 3,500 mg FDA daily value. The phosphorus content is 30 mg, or 3 percent of the 1,000 mg FDA daily value. Potassium regulates the heartbeat and phosphorus forms bone and teeth composition. Oil and Phytochemicals: Olive oil provides omega-3 fatty acids, which protect the cardiovascular system against disease. Among the many phytochemicals pesto ingredients contain, allicin is a compound in garlic that improves blood pressure by preventing blood lipids from sticking together. Basil contains antioxidants, which protect healthy cells from toxins that cause disease, and pine nuts contain healthy fats important for nervous system support. Combine the basil in with the pine nuts, pulse a few times in a food processor. Add the garlic, pulse in food processor a few times more. Serve with pasta, or over baked potatoes, or spread over toasted baguette slices right away or you can freeze it. 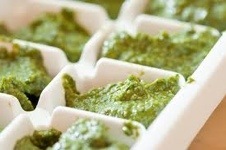 If you’re planning on freezing some or all of the pesto you make, you’ll need an ice cube tray or two. I also like to have some olive oil in a condiment squirt bottle for drizzling out small amounts, but you can also pour from the original olive oil bottle or use a spoon. It’s helpful to know how much each of the ice cube compartments holds, so that you can easily remove the needed amount from the freezer later on. To figure this out, use a measuring spoon and add water to one of the ice cube compartments in your trays to determine how much each cube and tray will hold. My ice cube compartments each holds approx. 2 tablespoons. Use a spoon to fill the compartments of the tray with pesto. Use a squirt bottle or spoon to drizzle a light layer of olive oil over the top of each cube compartment. This will keep the pesto from getting dark from contact with the air. Cover the tray with plastic wrap. Gently tap the plastic down on top of each cube section so it keeps out as much air as possible. Put the tray in the freezer for several hours or overnight so that the cubes freeze completely. Label quart size plastic freezer bags. I like to put the quantity of each pesto cube on the label (1 cube = 2 tablespoons), in case this old brain of mine forgets that detail when it’s time to use the frozen pesto later. Once the pesto is frozen solid, remove the trays from the freezer. I flip the ice cube tray over and put it under the the faucet to trickle some cold water on the bottom of the tray for a few seconds–hold your hand underneath the tray so the cubes don’t fall into the sink. The pesto cubes pop right out. Fill the plastic bag with frozen pesto cubes and return it to the freezer. The next time you want to add some quick flavor to pasta, or meat, or salad you’ve got it in your freezer. Very yummy!